Chances are you are a coffee lover. You look forward every morning to your cup of hot, delicious coffee and just wouldn’t be the same without it. In fact, you might even be grumpy if you had to skip your morning coffee. Sometimes, for those who travel or like to camp, the challenge of having a good cup of coffee while you’re traveling is very real. However, being a part of the 21st century means that we get to be a part of some pretty cool and innovative machines. 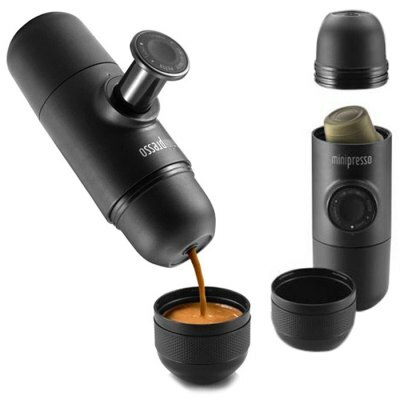 Now you can take your espresso on the road with you, whether you’re camping, going to work, or anywhere for that matter. 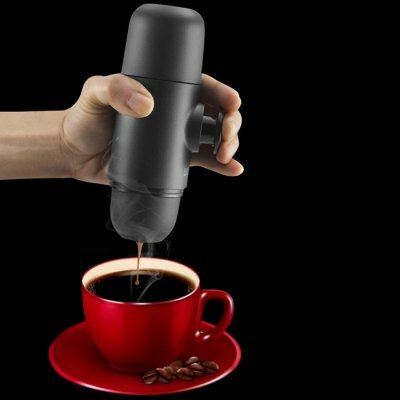 The WACACO Manual Minipresso Espresso Maker is a favored portable espresso maker that coffee lovers are raving about. The small portable machine look something like a bicycle pump, comprised of a coffee basket, the main body, and a cover that locks. You simply put your finely ground espresso coffee in the filter basket, tamper it down with the end of the pump, fill up your water chamber, screw on the lid and begin pumping. As you pump, you add pressure to the chamber. Then, the pressurized water pushes through the coffee and brown liquid gold (aka espresso) enters into your cup, giving you wonderful shots of espresso at your convenience. You don’t need batteries for this or a plug-in. It is completely handheld and manual, which is certainly an asset for those who are camping or traveling away from home. Good news is that the WACACO Manual Espresso Maker is in a price range that most anyone can afford. You get high quality espresso shots without having to spend hundreds of dollars. That’s a huge plus right there. Go ahead and enjoy espresso anytime, anywhere! It’s compact, small enough to stick in your purse or backpack.